HTML version of slides (with animations) can be found by clicking this link right here. Or a pdf version is right here. The informational one-sheet can be found here. Spool of conductive thread. I like Adafruit's 2 ply for ease of sewing. We gave everybody 10ft for the workshop. A battery holder. We used Adafruit's sewable CR2032 batteries. Two CR2032 batteries, again from Adafruit. 10 sewable LEDs. We used Sparkfun's LilyPad LEDs in various colors. They also have smaller ones without resistors (so you have to be careful with your voltage) - these are the ones in the above link labeled "Micro". 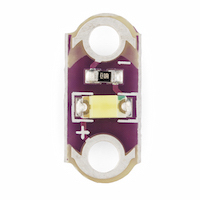 Adafruit also sells LED sequins you might want to check out. Sewing needles - you need to make sure you get ones small enough to fit through the sewable battery's holes. Something to sew on! A scarf, a hat, pants, go nuts! We used Beanies from ebay. No link, since the level of that type of merchandise is always in flux, but keep your eye out for stuff on their you want! The workshop started with a little introduction to electrical circuits. In addition to sewable electronics, we had a bunch of fun fabric! A participant outlines their circuit and does some sewing. A finished ocean themed hat. A cool multicolored number hat. A super sweet dragon hat.